A fresh and delicious way to eat a rainbow medley of vegetables that is accompanied with a sweet & slightly spicy peanut sauce. Perfect for a quick and easy lunch, dinner, or even as a snack. Prep all of your vegetables and arrange them buffet style so that they are all ready to go. Feel free to add any additional vegetables that you enjoy. You can also include chicken, shrimp, steak, or tofu. Begin by softening the rice paper, one at a time, in a large bowl filled with warm water for about 5 to 10 seconds each. If you’re rice paper is breaking, it is most likely because it’s been dipped in the water for too long. Remove rice paper from water and lay on a flat surface. 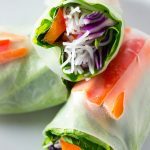 Beginning at one end of the rice paper, layer your vegetables beginning with the lettuce first and then adding the cabbage, bell pepper, carrot, rice vermicelli noodles, cilantro and basil on top. Gently fold rice paper end over the veggies once and then tuck in the edges. Once edges are tucked, continue rolling and tucking in edges as tightly as you can without ripping the paper until the seam is sealed. Serve immediately with peanut sauce! If not serving immediately, wrap spring rolls in plastic wrap to preserve. If your spring rolls contain meat, be sure to refrigerate as well until you are ready to serve them.